What happens during a Revive power flushing process? The Revive power flushing pump is simply connected into heating systems, either across the standard circulator pump couplings, across the tails of one radiator, or wherever most practicable. Power flushing is a highly effective cleansing operation which works by pumping water at a much higher velocity than usual through the heating system, to loosen and mobilise harmful corrosion deposits, and to suspend them in the rapidly moving water. The process is made more effective by specialist cleaning chemicals, and an instantaneous flow reversal device, which creates turbulence in the radiators to optimise ‘pick up’ of the debris. Once loosened, the unwanted debris is purged from the system with clean water. At the end of the flushing process, the system contains fresh water, and reinstatement of the system to normal operation takes only a few minutes. During the REVIVE flushing process, radiators are individually flushed, without removing or disconnecting them from the system, by directing the full output of the pump through each radiator separately. 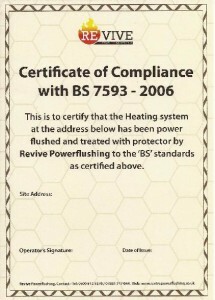 Revive power flushing is not a high pressure operation, and it is suitable for most domestic wet central heating systems. 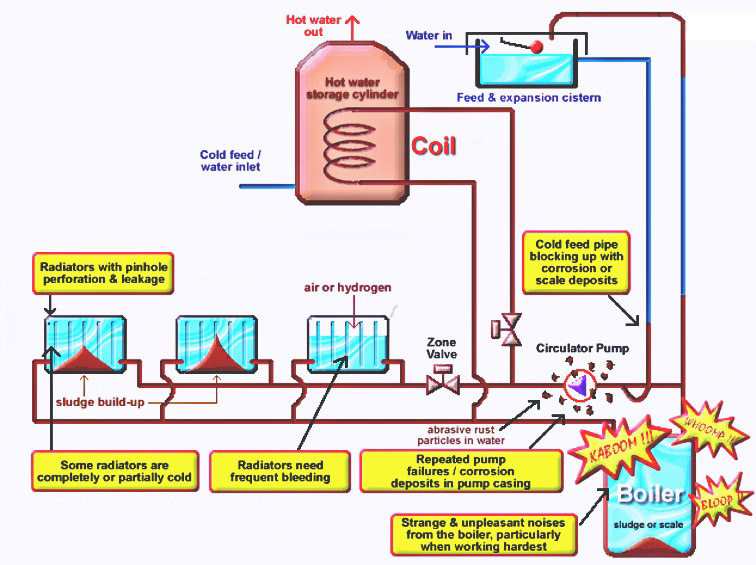 It is carried out with minimal disturbance and disruption to the normal operation of the system, without disconnecting the boiler or any radiators. 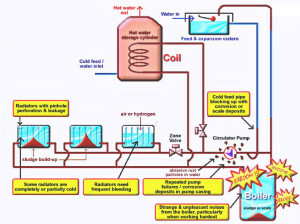 Typical system layout and problems that can be associated with this type of open vented system. A Breakthrough in System Cleaning It has taken the heating and plumbing sector many years to recognise the benefits and full potential that power flushing process can bring to ageing, sludge-ridden, heating systems. The procedure is extremely effective. Extensive testing has demonstrated that power flushing is the best industry practice when it comes to maintaining central heating systems. Power flushing process has the ability to restore circulation and improve system efficiency with minimum disruption to the household. The whole system is heated to normal working temperature and each radiator is checked and balanced so as to give even distribution of heat throughout the property. The system is treated with Systemsafe DM, a high quality corrosion inhibitor to prevent the return of corrosion and sludge in the future. Revive recommends that the level of corrosion inhibitor is checked and topped up every two years to keep the system in peak condition. 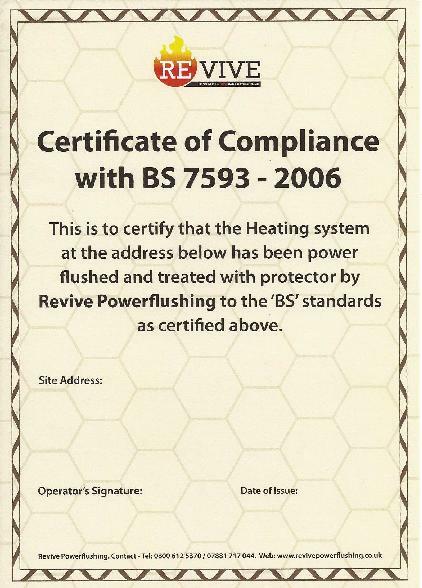 Finally the customer is provided with a certificate of guarantee that the system has been cleaned and treated with corrosion inhibitor to BS-7593-2006 Part L building regulations.